Ayur Sandal Face Pack - Who Should Buy ? 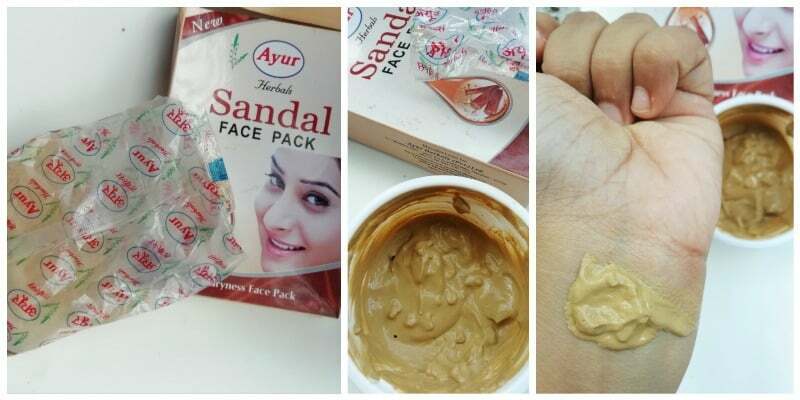 Home ReviewsBeauty Ayur Sandal Face Pack – Who Should Buy ? Ayur Sandal Face Pack – Who Should Buy ? Who is it for? Ayur Sandal Face Pack is for all those beauties who are looking for a clay pack. Yes, you heard it right it’s more of a clay pack than a sandal pack as this has a very small percentage of the sandal to it. Take a spoon full quantity and add some Gulab jal to it. Mix it well; there shouldn’t be any lumps in the paste. Now apply this pack after scrubbing and cleansing your face. Leave it until it dries completely, now washes is off gently in circular motion, with cold water. Tip - you add Aloe Vera gel and few drops of lemon to it. This comes in a plastic pouch packaging, secured by card box packaging. This has all the necessary information about the product. This smells like any normal calamine pack. The product comes in powder form. You need to add water, Gulab Jal, or any solution to make it into a paste form. I love the way my skin feels after applying this pack. This leaves you with matt oil-free skin. Also, this helps in closing up the pores. My skin feels light after applying this; it’s as if the whole gunk is extracted out of my face. This one doesn’t dry out skin even a bit. I love this pack to bits. Definitely yes. This face pack is for all skin type. I am very impressed with the results of this one. When I tried it .. I felt that it dries your skin so much that it might can lead to itching … You will need to apply moisturiser instantly ..
Add little honey to it sweetie or aloe vera, tou skin will feel supple, oh and don’t extend the timing wash it off as soon as it dries. Don’t follow 30/45 minutes rule. And don’t apply it in thick coats. The results may be good but i wish it was not in powdered form, but atleast its natural 👍🏼 Good review! Great review.Keep up the good work! Does it beneficial for pimples prones skin ? Good product and nice review. Thanks shubhan… Works well for guys as well. This is an awesome product. Affordable and effective. It’s a NYC product n it’s effective. Thank you for such detailed and precise review prachi. Ayur skin care products are pretty good and affordable too. I’m definitely gonna try this one. The product is cheap and effective . It has given my skin soft texture and well hydrated with firm collagen and elastin support. Tremendous job Prachi !! Keep up the good work girl. this product works too well for my combination skin.. my friend introduced me to this product. great work Prachi , images are so clear. I love powder face packs..